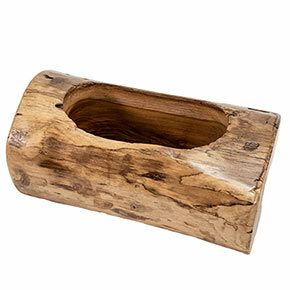 The Natural Teak Planter has a sophisticated, artisanal look that's gorgeous for home décor. 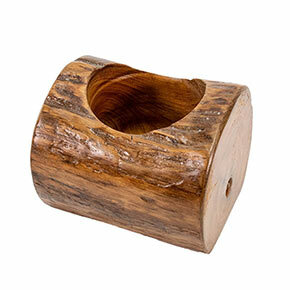 Teakwood is one of—if not THE—hardest hardwood. Its water resistance is particularly exceptional. 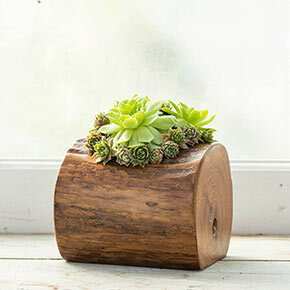 Because it can take around 80 years before a teak tree should be harvested to make wood, we're especially proud to say these planters are all made from reclaimed wood. The wood was originally harvest for things like furniture, and now creates a beautiful space for more plants to grow. 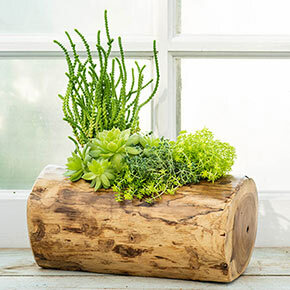 Since it is real Teakwood, no two planters are alike—yours will be completely one of a kind. Please be sure to protect fine furniture. 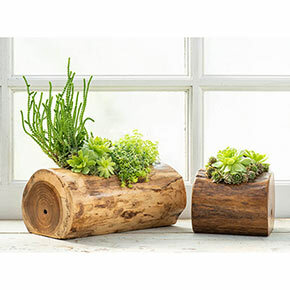 Planters do not have drainage holes, so put crushed pottery or wood chips in the bottom to give water a space to drain out of the soil. They've been carved into two sizes—Natural is L10"xH4½" and 3" deep; Petite is L5"xH4½" and 3" deep.